Pneumatic conveying system design specialists truly understand not only this field, but all aspects of it including installation, operation and maintenance. They also couple their designs with experience in related and relevant areas such as products that are generally considered different but happen to share similar conveying characteristics. Read on for an overview on several major intrinsic considerations that apply when designing a pneumatic conveying system. In designing conveyor systems and their components, the first consideration is what materials are going to be moved. Product bulk density is used to calculate how much air is required in litres per minutes to convey product along a pipeline. Materials that have bulk densities from above 400 kg/cubic metre to 880 kg/cubic metre are easy to move using pneumatic conveying. High density materials greater than 880 kg/cubic metre need bigger vacuum receivers and more power. Low density materials such as fine powders like fumed silica may require increased filtration and dust collection systems. 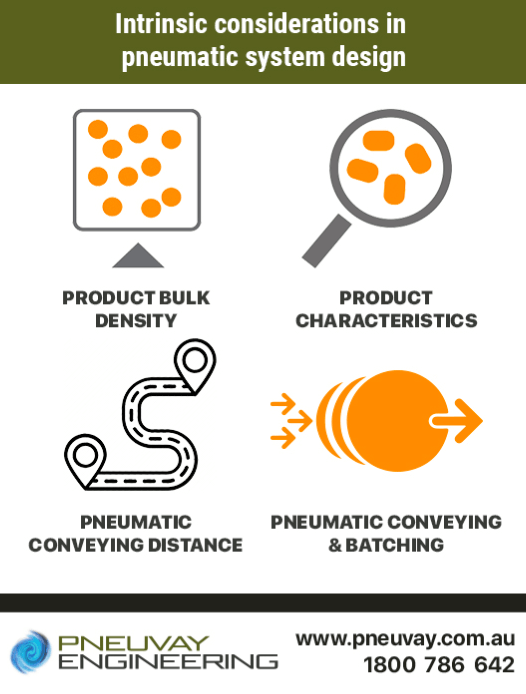 When designing a conveying system it is essential to understand and consider how each substance, every grade, consistency and type of each substance behaves under various conditions and in different environments. Expert knowledge of this vast pool of data and information is required. When designing conveying systems that use a vacuum process, it is vital to understand how, not only the bulk density of a substance, but also how it will behave under certain conditions. Clients generally know if their product is a free flowing powder, sluggish granular material or non-free flowing and clay-like substance. It is imperative this information be included in the specification for consideration in pneumatic conveying design. Each product group may well have a number of product grades, each with different characteristics and behaviours. An example of this is zinc oxide where one grade has a consistency of talc. Another grade of zinc oxide may be greater in cohesiveness and have a stronger tendency to adhere to the inner surfaces of conveyor tubes. Indeed, some materials can be greatly affected by environmental factors such as humidity, so they display different characteristics on a daily basis. Should a leak occur in a pneumatic conveying system using a vacuum process, it would be directed inward and avoid dust clouds forming within the plant. However, leakage in a pneumatic conveying system using a pressure process would cause a dust clouds to form within the processing plant and generate a severe risk of a combustible dust explosion. Products that are non-free flowing generally require the greatest number of modifications to equipment. There are many methods for handling non-free flowing products, and these can negate the necessity for promotion of external flow like specialised finishes, oversized openings for discharging receiver, discharging 70 degree cones and proprietary straight-walled (coneless) vacuum receivers. Equipment modification may be necessary for the handling of non-free-flowing products such as herbicides, fungicides and insecticides, particularly when there is greater throughput required on a product line in a powder processing plant. An example is a plant that had to stop using manual labour to dump from a raised platform 20 to 40 drums of chemical powder, weighing approximately 100 kg each. Using mechanical systems, such as bucket elevators proved unsatisfactory. It was found that using a pneumatic conveying system was the most effective way raise, in 30 minutes, several hundred kilos of product up a level to the volumetric feeder. In this example, the non-free flowing product was claylike material, which was, in fact, semi-free flowing. This caused rat holing and bridging in the material receiver. Resolution of this issue could be achieved by use of a vacuum receiver with straight walls (coneless) rather than a standard receiver, with a discharge valve that would fully open to provide a fast refill to the system feeder on the lower level. In this system, optimal filtration was achieved by using a specialised multi-filter using pleated filter material fitted to the vacuum receiver. In this way, the process would be a one-person operation that would reduce environmental dust to a minimum and resolve the ergonomic problems entirely. Also essential in determining what components are required when considering system size and type is distance – how far will the bulk solids material need to travel. The greater the distance, the more piping will be required and the larger the vacuum pump will need to be. When powder is most be moved further than 90 metres, the most economical method is by use of positive pressure rather than vacuum. This is also the case when material is entrained in the airflow, i.e. a dilute phase system, further than 90 metres. The distance products are being conveyed pneumatically is calculated in linear metres. Conveying horizontally or vertically is considered equivalent and calculated as their lengths in metres. Each sweep of 90 degrees is the equivalent of 6 linear metres. Using this as the basis for calculation, there would be 90 metres conveying distance to move material in a system that had 33 metres of horizontal piping, 33 metres of vertical piping and four sweeps of 90 degrees. Another major factor to be considered is the speed at which material moves through the conveying system and whether it is a batching or continuous process. In general, pneumatic conveyor systems operate in cycles of conveying a material along a given distance and then discharging it. However, a system that uses a batching process does behave differently to a system that uses a continuous process. Batching often has a major impact on the system size needed to meet production requirements. For example, say we are required to convey 2.25 tons of product per hour to a mixing stage. However, we have only 15 minutes to convey the powder into the mixing equipment as a batch. Even though the system is conveying 2.25 tons per hour, the batch transfer of the 2.25 tons occurs in only 0.25 of an hour. The system is effectively moving product at 9 tons per hour during the batching. This batching process would require a much larger vacuum system at the transfer rate is much greater. Pneumatic conveying systems using dilute phase can transfer up to 12.5 tons using a vacuum process (negative pressure). To convey product at higher rates, a positive pressure process is required. If you have any questions in relation to pneumatic conveying for a specific process, feel free to call on 1300721458 or contact us. You can even send us a message via our Facebook page if you like.